But the recovery is still fragile. Everyone remembers the startling images of the powerful tsunami that hit the coast of Japan in 2011 and the destruction created in its aftermath. 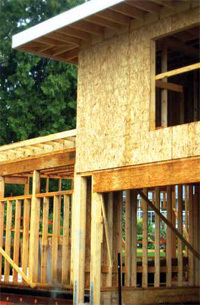 For Canada’s oriented strandboard (OSB) industry, the economic tsunami caused by the collapse of the United States housing market has had a similar effect. It resulted in across-the-board production cutbacks, the closure or indefinite curtailment of 10 out of 27 OSB plants in Canada, and the loss of thousands of jobs. To put the contraction of OSB production in Canada into perspective, APA – The Engineered Wood Association says that there was a capacity to produce 12 billion square feet of OSB on a 3/8” basis at the market peak in 2006 and production was running at 95 per cent capacity. In 2012, production capacity was still at 9.47 billion square feet, but the industry was operating at a capacity of only 58 per cent. All of Canada’s major OSB producers—Ainsworth, Tolko, Louisiana-Pacific, Georgia-Pacific, Norbord and Weyerhaeuser—all retracted operations to some extent, resulting in major curtailments or outright indefinite plant closures. The carnage may not be over yet. Norbord has announced that effective July 2012, it will indefinitely close its OSB plant in Val D’Or, Quebec after operating it in partially curtailed mode for the past five years. The decision put another 120 industry workers on the unemployment line. A notable casualty of the OSB market collapse was Grant Forest Products, a mainstay for decades in north central Ontario, with OSB plants in Englehart and Timmins. It also had a 50 per cent interest in Alberta’s Footner Forest Products with Ainsworth Lumber. At one time, the Englehart plant was noted for being among the largest OSB production facilities in the world. 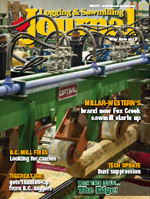 Georgia-Pacific has picked up some of the pieces from Grant, and Ainsworth has bought out Grant’s 50 per cent share of the mothballed Footner Forest Products OSB plant near High Level, Alberta, to take full ownership of that facility, which even now is among the largest, most modern, OSB production facilities in the world. There is little doubt what precipitated the colossal drop in OSB demand over the past five years. According to the APA, U.S. and Canadian housing starts tumbled from their high of 2.44 million in 2005 to their lowest point of only 753,000 in 2009, having posted four straight years of double digit reductions. The bubble and subsequent collapse in the U.S. housing market was caused by questionable mortgage lending practices by American financial institutions, which itself has suffered casualties like the bankruptcy of Lehman Brothers and the merger of other household Blue Chip banking names simply to survive. “You would hope that some lessons have been learned in the financial sector from the extreme availability of credit that created a real housing bubble, followed by the extreme correction,” says Bob Knudson, research leader for engineered wood products manufacturing at FPInnovations, Canada’s forest products research institute. As the dust settles and the North American housing market begins to show signs of life, there’s hope that the OSB industry has finally reached a capacity that accurately reflects current market demand. Housing starts grew by 10 per cent in 2010, three per cent in 2011, and are predicted to grow a further eight per cent in 2012. A number of companies who responded to Logging and Sawmilling Journal’s questions shared their future outlook for OSB demand and acknowledged positive trends in the American housing market. The OSB industry appears to have also learned some hard lessons as a result of the housing collapse. It is undergoing a fundamental change with investments in new value-added production that is not dependent on the housing market, modifying production lines to have the capability to produce more than commodity grade OSB, and some companies are putting more effort into pursuing new, non-traditional markets. 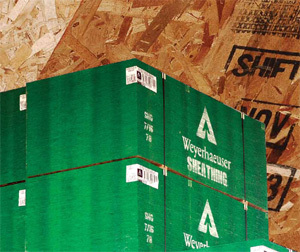 Weyerhaeuser announced in March that it will produce JAS-certified OSB material for export to Japan, which will be used in both residential and commercial construction as wall and roof sheathing, and structural floor panels. The OSB will be manufactured at the company’s Hudson Bay, Saskatchewan plant, using a proprietary formulation specifically engineered to meet JAS strength and stiffness criteria, as well as the stringent F4 requirements for formaldehyde emission levels. The company also now offers a number of value-added products such as Edge Gold panels with Down Pore self-draining technology, according to company spokesman Wayne Roznowsky. However, as to the company’s general outlook for commodity grade OSB in 2012 and going forward, Weyerhaeuser is keeping its view definitively short term. 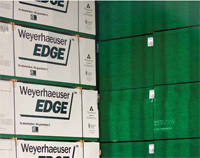 “As mentioned in our Q1 earnings release, Weyerhaeuser expects higher sales volumes across all wood products during the second quarter of 2012,” says Roznowsky, but he adds that the company will not comment beyond the current financial quarter. That short term view is echoed by Jim Lake, Ainsworth President and Chief Operating Officer. Tolko’s OSB plant in Meadow Lake, Saskatchewan is a good example of a company being innovative so that it is less dependent on residential sheathing for the American housing market. For the first time in North America, it has demonstrated the ability to quickly convert its production line from manufacturing commodity grade OSB to other engineered wood products such as laminated strand lumber (LSL). It has also launched T-Grade, a new re-engineered OSB flooring product for the residential market that is a more moisture resistant, stronger, more stable product. Louisiana-Pacific has also developed an OSB siding product that it has marketed for a number of years. The product has weathered the economic storm much better than commodity OSB. The high value of the Canadian dollar at present compared to the American dollar may be adding to their reluctance. As curtailments linger, several companies now face pressure concerning their future use of the publicly-held fibre resource. In some cases, fibre resources have been taken back by government, particularly in situations where plants have been closed permanently. Roznowsky says that Weyerhaeuser does not intend to reopen its OSB plants in Drayton Valley, Alberta and Wawa, Ontario, and recently sold its idled Miramichi, New Brunswick mill to Arbec. Any additional production will be taken up by its two remaining Canadian OSB plants in Hudson Bay and Edson, Alberta. Nowhere in its first quarter report has Ainsworth given any indication that it intends to complete its partially constructed second line at its Grande Prairie OSB plant or reopen its now fully-owned Footner Forest Products OSB plant. As with its competitors, the company has its sights set on expanding its product lines and possible business expansion in Asia. As a leading supplier of OSB to Japan, Ainsworth says it continues to pursue the significant growth potential of this market, adding that it is also making inroads into other market regions, notably China, where significant progress was made in the first quarter with new product development initiatives. One important factor working in favor of Canada’s OSB industry is that many plants where production curtailment or temporary shutdowns have occurred are among the most technologically advanced plants in the world, with examples being the Footner Forest Products plant, the Tolko plant in Slave Lake, Alberta, and the still-to-be-completed second line at Ainsworth’s OSB plant near Grande Prairie. How quickly companies could re-commission mothballed plants will really depend on how carefully the plants were idled down and maintained during curtailment, Knudson says. On the downside, many of these plants are located in areas with very low unemployment among skilled laborers. So even if companies wanted to restart idled production facilities, it would likely take some time to put the proper staffing in place. Going forward, Knudson says it will be quite important for OSB producers to have the ability to make several different products aimed at a variety of markets from each plant to avoid the potential shock resulting from the collapse of a single market. He also sees plenty of opportunity for OSB in value-added products to complement commodity grade material, such as in the area of engineered lumber and hybrid cross-laminated timber products, as well as opportunities in the non-residential building market. “Having a really good non-commodity product can pay dividends,” he concludes.